You are here: Home / Adam in the Media / Adam Lambert Goes Bravo, if Not a Bit Frugal! 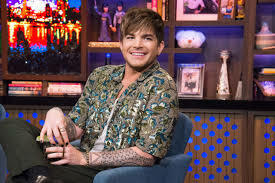 Adam Lambert was a guest last night on Bravo’s Watch What Happens Live. I’m writing this a little cryptically so the videos don’t get pulled. The full show video from a fan got pulled already. A few clips have been posted by the network, and they’re below. Let me start by saying this was his BEST appearance on the show! Also on was Chrissy Metz, a talented actress from This Is Us. Chrissy, who just won the Golden Globe for her portrayal of a triplet who’s facing the daily stuggles of making a severe weight change, was a true team player. She didn’t make any attempt to steal the spotlight, unlike Adam’s first experience on the show with Name Withheld. Clip #1 – Adam Spills the Tea! Clip #2 – Romantic with Sam Smith? Thank you Kathy Katz for the video. If you see Andy handing Adam something, it was one of Adam’s rings – he asked if he could try it on. Going in the past for a second. I bought the Live Nation Tour DVD/CD finally found it in BestBuy. Played it in my car driving to work. Just beautiful. Love the new look. He just keeps getting better looking if that’s even possible. Didn’t get to watch the show ONLY because I don’t get the channel. I too like his look! It makes him look so young. Reminds me of ‘back in the beginning. Lord, I am 67 yrs old & completely, totally gone on Adam. Have been since American Idol days. He’s just a doll! I watched the show because I usually watch it. When Adam was on I was thrilled. He was funny and just as adorable as ever. I like his natural look. Seems like his hair is getting back to its original color slowly. Tomorrow it could be black again. Love his ever changing looks. I really like Adams new look. I did not like the facial hair at all. He looks so much younger and more handsome with the new look! Can’t get enough of looking at him with that cool looking hair! Adam, You are back to your handsome look again. Not that he could ever not be handsome! I do like it that he changes up his looks, though. Thank-You again Carol for the nice videos. Love you, Adam Lambert!